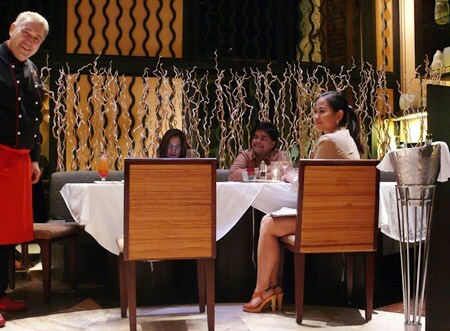 We tend to forget just how lucky we are in Pattaya, with several world class restaurants available. 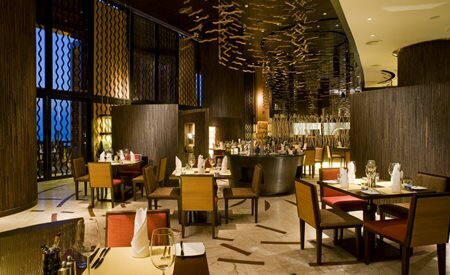 One of those is the Acqua Italian restaurant which is in the Centara Grand Mirage Beach Resort (one of the longest names in Pattaya resorts). Everybody in Pattaya must be aware of just where the Centara Grand Mirage Beach Resort is situated, but for the ‘newbies’ this huge property is accessed by going down Soi 18 from the Pattaya-Naklua Road. Go right to the bottom of the soi and turn right and the Centara Grand Mirage Beach Resort is on your left (watch out for the speed hump). The entrance is a little hard to spot, but once there you will find plenty of secure parking. Go in the main lobby and Acqua is on your right, complete with welcoming staff. 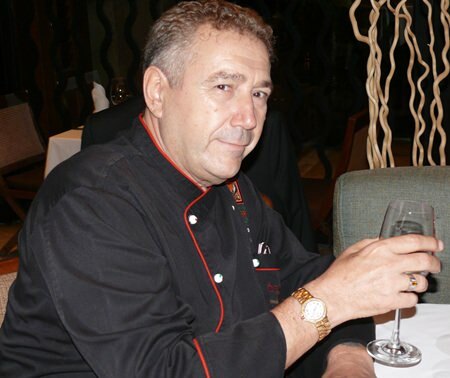 Now, Acqua is not only well known for its food and ambience, but is notable for the fact that it is under the apron of Chef Alberto Bruni, a man who enjoys life and living it, complete with red shoes. He also says that he is not related to Carla Bruni. The venue is certainly up-market with high quality napery and fine wine glasses. The efficient service staff is also decked out in uniform. The wine that Chef Alberto suggested we have to accompany our meal was a Collavini Sauvignon Blanc 2012, with Alberto saying, “I walked this vineyard many times. It is the best white wine in Italy today.” At B. 2,300 a bottle, it was certainly not overly expensive, for a wine which we all agreed was quite exceptional. 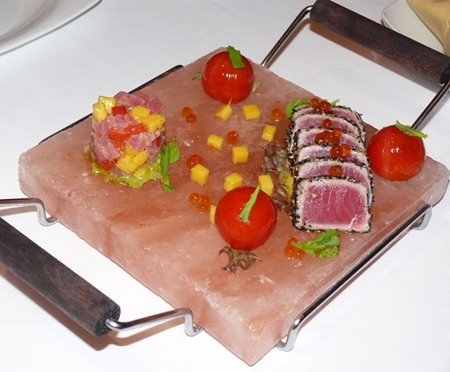 Our first dish was an Alberto Tuna composition incorporating a broiled tuna carpaccio, tuna tartar, yellow mango and Pachino tomatoes, served on a slab of salt. And did you know that ‘carpaccio’ came from Vittore Carpaccio c. 1465 – 1525/1526 who was an Italian painter of the Venetian school. I didn’t, but Alberto soon appraised me of the fact. In addition, Pomodoro di Pachino (Tomato of Pachino) is an IGP/PGI classification for tomatoes from the southeast coast of Sicily, for whom the EU granted IGP protection in 2003. Education aside, this was an excellent starter/palate pleaser. Next up were some pan-seared king prawns on crisp bread, similar to a bruschetta. The tender prawns contrasting well with the crispness of the base. The sauce was excellent and this was almost a meal on its own. A “simple” pasta dish had a sauce with Italian sausage, N’Duia, porcini mushrooms, pachino tomato, mascarpone and mozzarella. Italians know sauces, like nobody else. “My mother could make the best ones,” said Alberto. Another of the dishes we sampled was the signature dish of Spaghetti Lobster. The presentation of the pasta was between a lobster head at one end and a lobster tail at the other. Another great dish with artichoke with the pasta. The menu in this restaurant is not really necessary – just ask Alberto for his recommendations. He knows his menu, he knows his kitchen and he knows every ingredient in it (most of which come from Italy anyway)! A fine example of this is Chef Alberto’s use of Verrigni: Pasta Trafilata in Oro, reputedly the finest pasta in the world, extruded through a gold sieve, complete with cooking times worked out to the exact minute. Another interesting and historical menu item was Insalata di Cesare Cardini which was a Caesar salad as per the original Cesare Cardini’s recipe created in 1924 in Tijuana Mexico. Crisp romaine lettuce with creamy roasted garlic dressing, croutons, bacon and Parmigiano reggiano. During five minutes with Chef Alberto you will learn more about Italian cuisine than you will by reading several textbooks. 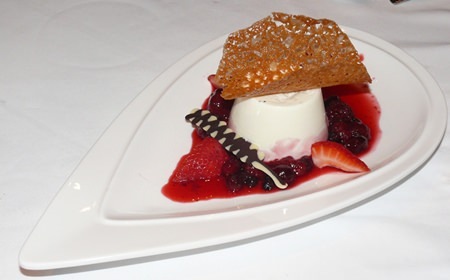 How do you rate a restaurant which is undoubtedly one of the best in Pattaya, with a ‘larger than life’ chef in charge? Alberto is Acqua and Acqua is Alberto. Not a cheap evening, but the finest things in life never are. Do go, you will not be disappointed. Highest recommendation possible. Acqua Italian Restaurant, Centara Grand Mirage Beach Resort Pattaya, 277 M5, open daily, 6.30 p.m. until 10.30 p.m., telephone 038 301 234, www.centarahotelsresorts. com, secure parking in the resort car parks.